BUSRide Maintenance brought together some of the sharpest minds in the bus industry for a deep dive on bus washing – spec’ing systems, the influence of technology, environmental concerns and maintenance considerations. Briefly describe the characteristics of your bus wash product and its best use. Bruno Albanesi: We make totally portable, mobile washers that move around the vehicle. In addition to the standard electric unit, we offer battery-powered, diesel-powered and hybrid-powered machines as well. This is the one way we differentiate ourselves from others in the market. Our machines are all stainless steel with a lifetime warranty against any weld failure or rust. Our brush-only incline offers more stability. A full-height side bumper protects the vehicle from contact with the machine as it moves around. We sell our units by telling the operator our product provides the “elbow grease” of a six-person wash crew in terms of friction power for the time he is using the machine, particularly for tall coaches washed fast with an even quality using a 12-foot-tall brush spinning at 120 RPM; much more efficient than several employees handwashing that same vehicle. Jack Jackson: Our system is a portable bus wash machine with a spinning brush and four caster wheels at the base. The brushes spin around on the tower as the operator walks the unit around the bus with the brushes cleaning and rinsing the surface. The electric-powered motor runs on 220V, 20AMP single phase or 15AMP three phase fed from an overhead cable or track system on rollers attached over the top in the ceiling, inside or outside the wash bay. The automated soap system mists the bus for washing the first time around. The second walkaround rinses the vehicle. Our machine only uses 5 gallons of water and less than 1 ounce of soap per minute and takes less than five minutes to wash a bus. We custom build to fit any size van, bus or coach from 7 to 14 feet. We fix the height of the brush for the customer’s tallest vehicle. Washing the smaller vehicles with the taller Tower wash, our spray bar ball valve shuts off the higher spray nozzles to reduce overspray. Joe Barge: We provide engineering, manufacturing, installation and maintenance for all of our equipment. From outfitting multiple automatic wash lanes to a manual wash bay, e always strive to provide the best possible system to meet our customers’ wants and needs. Using superior off the shelf components, we have the capability to customize each of our systems to fit the customer’s space and infrastructure; while still making it easy to operate and maintain without increasing the overall cost. Ed Evans: N/S Wash Systems are extremely efficient in their use of chemical, water, electricity and the amount of maintenance required to keep these systems operating correctly. NS produces a wide variety of product lines, serving from small transits and up to the largest transit operations, such as New York City MTA. N/S Wash Systems are excellent for high volume transit. Although, we can service any size fleet through a very wide range of equipment options. Steve Wawro: Westmatic manufactures fully automatic drive-through and gantry systems that are specially designed for large vehicles such as buses. These systems can be retrofitted into an existing wash bay, or designed for use in a new build. Our company has its roots in Sweden which has some of the strictest regulations in the world regarding the use of water and power resources. Our machines meet and exceed those regulations and we retained that high–efficiency design in our American made machines and as a result, they use less water, chemicals and electricity than many machines on the market today. Our equipment requires minimal maintenance costs, do not use air components or hydraulics, and the brushes are electronically controlled using high-efficiency electric motors. What determining factors should operators consider in spec’ing a bus wash system for their operations? Albanesi: The specific location of the system or if it needs to be portable is certainly a consideration. Do you bring the bus to the wash or the wash to the bus? In most situations, a company can’t have an outside installation. For instance, with an outside electric system the hoses freeze in the winter. We have customers who want to wash outside, but cannot have a permanent outside installation. With a battery powered machine, the customers typically store their unit indoors and roll it out during the day to do their bus washing. Jackson: Washing frequency should be the biggest consideration. The operator needs to know how often they would like to wash the buses — per day, per week, per month. This will help determine the type of system to purchase. Our customers range from one operator with one bus up to fleets washing over 60 vehicles a night. An operator looking at wash systems must decide between desire and what he really can afford to pay per wash, and then work out the budget, which is typically what the company allots. The environment and location of the wash bay are other considerations. A large automated system or even washing by hand must meet the environmental specs of the local municipality. Companies can save a massive amount of time and money knowing this prior to permitting. Our equipment carries the same classification as a pressure washer and does not require permits for a fixed system. Barge: First, the number of vehicles in the fleet, and then how and how often they want them washed. Transit agencies need to determine the infrastructure available for the wash equipment, whether at new or existing facilities. The purchase purchase of the best and most suitable equipment for the long term typically depends on the capability of the procuring agency to choose wisely among the participating bidders. We recommend points-based RFPs so that all companies can quote their respective solutions. Operators should never assume that they don’t have a choice in these matters, because they do. – What types of vehicles make up your current fleet and how do you see your fleet growing in the future? – How many buses do you need to wash each day? Do you need to increase your volume? Are your routes expanding and are you adding more buses to your fleet? – Who is responsible for washing the bus? The actual driver or maintenance staff? We have a system that guides the driver through the wash system via a series of traffic signals. We want to make the wash experience as safe, consistent and thorough as possible. – Have you considered life cycle costs and operating costs? Consumables, maintenance and repairs can put a strain on your budget. Our goal is to help you manage costs and prolong the life of your buses. Evans: Obviously, the size of the fleet, as well as the amount of space the owner has allowed for a wash system. An often-overlooked factor to consider is the features the buses have, such as bike racks and unique mirror configurations, etc. As the budget is always an issue; operators must consider the operating costs, including the day to day operating costs of the system; and then the frequency and desired quality of the wash itself. Another important thing to consider is setting the minimum standard of quality through a detailed specification and one tool they can use is to require the manufacturer to be ISO certified when they submit their proposal. How is technology influencing the evolution of bus wash systems? Albanesi: The most significant advance we’ve seen over the past 20 years is how the brush fibers have improved. It began with the rock star entertainer buses with their deep paint colors and fancy graphics. They needed washing every day. To protect those surfaces, in 1998 Bitimec introduce the higher quality foam used in the car wash systems at the time. Fibers and detergents have really come a long way in the past 20 years. Most high-end brushes are all foam. The soaps and quality materials have become greener and people are just operating more effectively; plus, water filtration systems are much more common. Jackson: The evolution of our bus wash system, and all bus wash systems for that matter, lies primarily in brush technology. Today’s brushes are far beyond the issues that were implied scratching of a bad reputation from years ago. Today foam brushes dominate as they are non-penetrable foam; not a sponge that absorbs water or dirt and grit. They clean and polish at the same time with a life expectancy twice that polyethylene brushes. Secondly, the electronic push-button technology makes our machine simple to use. Entering the codes that run the optimum VFD variable drive, the variances make these manual tasks easier and allows a consistent, efficient and optimum wash every time. Wawro: Years ago, you had to call someone to tell them a machine isn’t working. Now you can remote in using a modem to see a system error. Thanks to our state of the art automation platform and custom programming, our machines can automatically self-diagnose and send alerts to a maintenance manager that a repair is needed. As RFID systems are integrated into the process, the equipment can track, assign, monitor, and increase accountability for anyone using the wash system. The RFID system recognizes which type of vehicle it is and adjusts itself to wash that vehicle. Barge: Where technology advances are influencing nearly every area of our lives, so it is with bus wash equipment which monitors chemical, water and vehicle usage rates. Wireless communication with instantaneous sensing and real-time reporting allow our equipment to respond to conditions in the wash bay and water treatment systems that may have gone uncorrected in the past. It’s all about more control of the process. Evans: Technology is enabling much more efficient wash systems in terms of the use of chemicals, water and electricity; using only half as much as traditional or older style systems while delivering an equal or better wash. Technology that monitors and troubleshoots remotely is rapidly making its way into our industry. As well as technology that conforms to the speed of the buses through the wash and adjusts accordingly. How important is an operator’s choice of chemicals and wash products? Albanesi: Closed pore foam is the default product now. Some people call it closed cell foam. It just means the foam is smooth. It doesn’t have those depressions where sand particles can lodge in with the soap and become an abrasive. Jackson: Water hardness or softness is the most difficult matter to gauge regarding wash products. The water quality should determine the chemicals and products to use. Many people overlook this point and become frustrated when they suddenly get streaking or water spots, or are using too much soap. Less is better not only cost wise, but environmentally and economically. Brushes clean much more than soap alone — which acts as a lubricator and brush cleaner. Barge: Quality chemical products are very important to the wash process. The best soap and wash chemicals are more compliant and environmentally friendly — and more expensive. This can be difficult for procuring agencies adhering to the cheapest price wins–style of bidding. 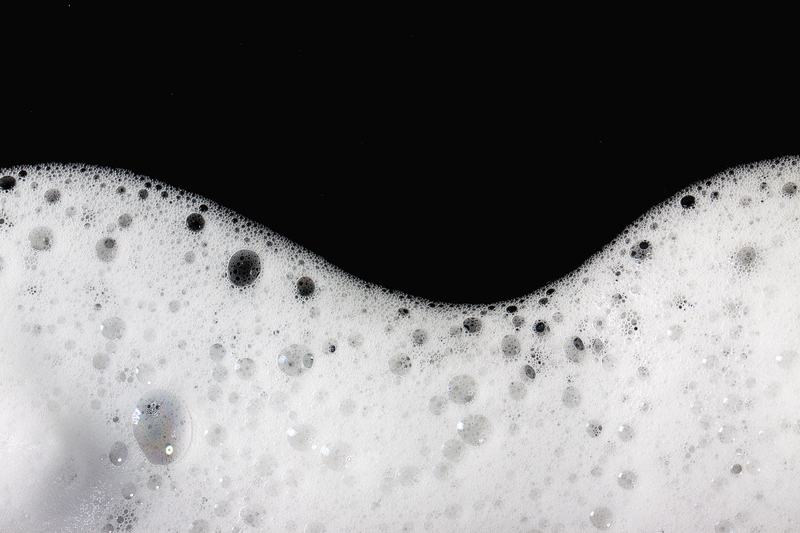 Some cheaper compounds in washing chemicals can adversely affect wash quality, equipment maintenance and overall cost; making it difficult for public agencies. Where purchasing criteria must consider the overall costs per wash for each vehicle over an extended timeframe, procuring the cheapest soaps no longer equates to the cheapest purchase. Evans: Special consideration should always be given on water recycling, depending on the volume and the size of the fleet. All systems require at least an oil-water separator prior to discharging to the sanitary sewer. Chemical selection is very important on getting the best result when washing the vehicle; not using the proper chemicals makes removing certain contaminants harder to remove and the water difficult to reuse. Wawro: While the cost of consumables is always a factor, operators should be aware of the effect that highly acidic (low PH) chemicals can have on bus paint and graphics. In addition, these chemicals can wear away at the wash system components, accelerating the need for repair or replacement. In short, what kind of maintenance requirements apply to your bus wash system? Albanesi: Our wash machines require little more than 15 minutes of maintenance every three months. That’s what we tell our customers. Basically, it adds up to an hour a year. The unit has seven grease points — four wheels plus the traction wheel down, and two grease trunk points on top of the machine. It literally takes a technician 15 minutes to do everything. Jackson: Typically, with our system, the caster wheels and brushes are the only wearable products. Foam brushes last over 40,000 washes and after 26 years in business, we have customers with machines over 20-years-old that are still running every day. We service program packages based on our DIY videos for their yearly maintenance. Barge: Our predictive maintenance technology acurate alerts technicians of which systems are likely to fail, allowing them to make replacements in advance. It’s called mean-time between failure, or MTBF. We incorporate stainless steel and corrosion-resistant materials, and choose components designed for the harshest environments. With preventive and predictive maintenance our equipment can easily last 20 to 30 years. Evans: N/S Wash Systems are designed with maintenance in mind, with fewer moving parts and grease points. It is our owner/designer’s theory of bus washing that, because maintenance of the system is so often overlooked, wash systems should be extremely low maintenance – which in turn makes them more reliable. N/S truly has minimal maintenance systems. Most brush movement is gravity-based, not an air cylinder, pulley or wagon being pushed into the bay. Also, by comparison, a chain with a life expectancy of 10 to 15 years with routine maintenance is preferred. Maintenance on a machine, with a belt, with a maintenance recommendation of changing once a year; can becomes a safety issue should it break, due to not being changed at the proper intervals. Wawro: Every manufacturer tries to make their equipment as maintenance free as possible. Our use of electronics (and not pneumatics) helps us achieve that goal. However, all equipment, much like your automobile, requires basic monthly maintenance to keep the machine performing at top efficiency. Most maintenance is done by a visual inspection and is hands free. We provide our customers with a maintenance checklist which keeps them on track. When purchasing and operating bus wash systems, what pitfalls should an operator work to avoid? Albanesi: One crucial point: some companies think that if they buy a very expensive bus wash system, they’ve eliminated the need for additional detailing. That is just not so. Even with the biggest, most expensive wash systems, the bus will still require some hand detailing in areas no amount of brushes can reach. There’s not a wash system on the market that’s going to replace the person doing that job. Jackson: Most individuals only purchase a bus wash system every 10-plus years or even once a lifetime, making the choice a wash system more overwhelming. Operators often choose a system without first gathering all the information on what best suits their needs. Today’s websites and videos should help operators to educate themselves easier than in the past. With any system, keeping up with the yearly maintenance will make operators happier with the overall performance as opposes to that dreaded expensive breakdown from all the years of neglect. Barge: Never underestimate the power specific requests in RFPs. Do everything possible to help purchasing agents avoid buying items based solely on price. Instead, create your specifications based on procedures as opposed to a manufacturers specific equipment selection. Capital expenditures will be held more accountable when there is good competition. Evans: Owners often overlook the day to day operating and frequently underbudget for service and repairs that are caused by drivers overspeeding through the wash. They sometimes don’t have enough information and understanding on the type of equipment they are purchasing, lack of maintenance after the equipment is installed with the expectation the equipment will last forever without proper care. Our wash systems are very similar in maintenance aspects, to the busses that they are washing; if maintenance is overlooked or ignored- there will be a need for service and repairs. To be honest, an operator should not have to be “married to a manufacturer” after the purchase. It is of great benefit to be able to source parts locally from multiple suppliers, as I don’t believe any manufacturer can be 100 percent in responding to all service requests. It is better to be self-reliant with other sources for parts — even though it can be a bit of a risk. Again, a minimal maintenance system should have parts easier to source locally. Systems that require many proprietary parts, often have a very high cost of operation due to the expense of replacement parts that can only be obtained through that manufacturer. Wawro: Don’t buy the cheapest. While budgets might be tight, cost and initial savings should not be the primary factor. Think long-term and be mindful of lifecycle costs. You want to make sure the machine can accommodate an array of vehicles. What is in your current fleet (revenue and non-revenue) and what do you predict will be in your fleet in the future? Research the manufacturer. Don’t be shy. Call references, visit facilities, make sure you see various pieces of equipment in action. Ask questions about how the machine meets that operator’s expectations. See www.busride.com for an extended version of this story in the Bus Wash Systems digital supplement!